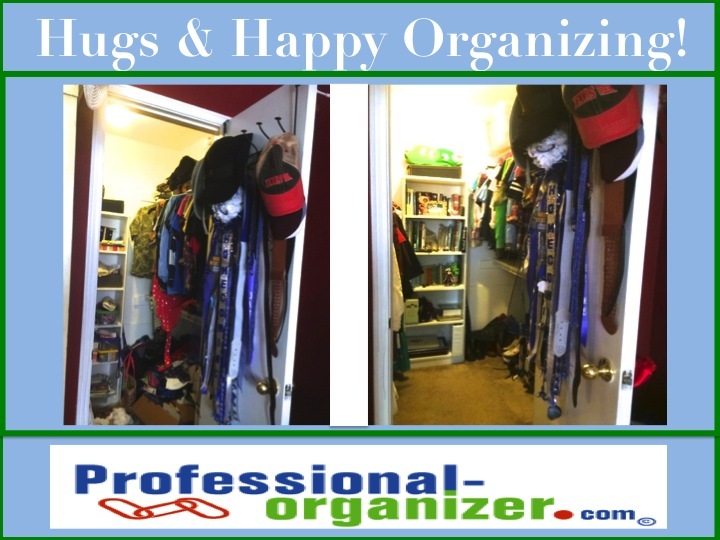 Hugs and happy organizing is all about sharing client success stories. Here is a happy ending for organizing a teen closet. Is your teen’s closet out of control? Too many clothes, shoes, and hats to keep organized? Too busy to get organized? Just schedule two hours with your teen on a Sunday afternoon to get her or his space organized. Organizing your teen closet will make everyone happier. If the floor of the closet is covered with shoes, pull them all out, match them up and see which are beyond repair or use. Drop these in the trash asap. Go through tee shirts and decide which are to wear and which are to make a quilt. Store the memorabilia in a box at the back of the closet or on the top shelf. Set a timer for 15 minutes and group clothes together by tops, bottoms, dresses, exercise, and sleepwear. Set a timer for 15 minutes for each clothing group. Create a consignment pile. As an incentive to your teen, getting money back for clothes will help them make good decisions about what should leave. Consider bins for tee shirts, swim stuff, underwear and jammies. Label the bin so everyone can drop in the items. Keep it simple and easy. The easier it is to put laundry away, the more likely it will be! Add a 3 section laundry sorter (click on clothes on this affiliate link) to keep clothes off the floor. Place it where the clothes drop. Kids love their clothes! Help them keep up with them with an organized closet. Summer storage tips: What goes in and what comes out? Thank you to Jenny Young of Uncle Bob’s Self Storage for sharing these ideas on self-storage. Summer is (finally) right around the corner. Before you can start celebrating on the beach, now is a good time to take stock of what you have at home and in your self storage unit and make some changes. Here are some ideas for what moves IN and what comes OUT of your self storage unit this summer. IN: Holiday decorations. Typically, the most common items heading into self storage during the spring and summer months are Christmas decorations, says Mike Nowicki, area manager for Uncle Bob’s in the Virginia region. OUT: Clutter. They call it “spring cleaning” for a reason. 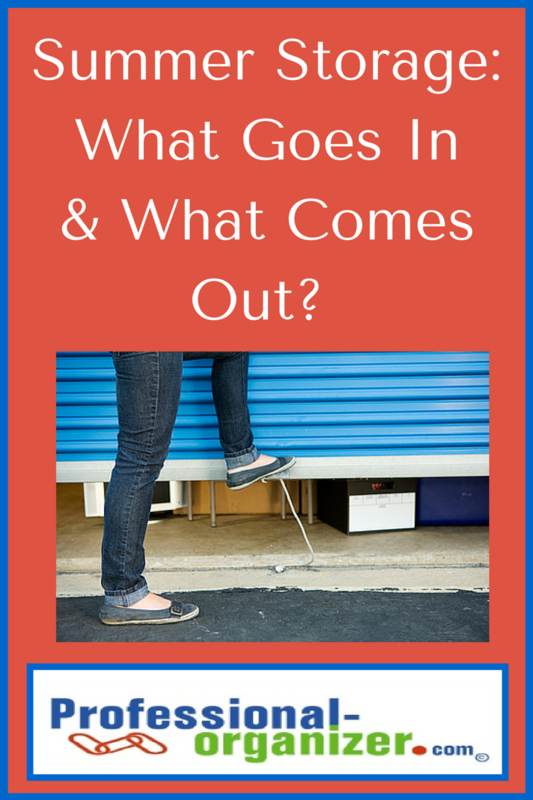 As you move things in and out of your self storage unit, do a lap around and take stock of what you have in there. Are there things you haven’t touched in years and probably won’t ever use again? Consider discarding them to free up space for other, more important items, or donating them to someone who could put them to use today. IN: Winter clothing and outerwear. The parka can be put away! Hallelujah. It’s swimsuit and tank top season, so move sweaters, coats, hats, and gloves into your self storage unit in order to make room for your warm weather ensemble at home. Bonus tip: While it might be tempting to stick your clothing in any box you have lying around, invest in a couple sturdy storage totes. You can typically find a good deal at big department stores this time of year, so a plastic bin will be well worth the $10 or less it’ll cost. OUT: Lawn and landscaping equipment. Nowicki tells me the most popular things he sees coming out of self storage units this time of year are lawn care and landscaping equipment. That means grab your car, and load it up with the lawnmower, weedwacker, rake and other garden tools you’ve been storing away all winter. Friendly Reminder: There are many items you should never keep in your self storage unit, which include many things you might be purchase over the summer. Pool chemicals and weed killers, gasoline for your lawnmower, and propane for your grill are a few of the items you should never put into storage. Keep that in mind as your stock up for the season. IN: College dorm essentials. As your kids move home from their universities, tell them leave their stuff in storage facilities in their college town, rather than take it all home. It’s a win-win for everyone: It’ll save them the hassle of transporting it a far distance, and it’ll save you the headache of finding a place to put it in your already cramped storage spaces. “My experience shows that college students get together and share a larger storage space and split the rent. This makes it easier to afford the space, and it allows them quicker set up in the fall when they return to school,” says Nowicki. OUT: Camping gear. Take advantage of the great weather, and sleep under the stars! If your tents and sleeping bags have been tucked away all winter, it’s time to grab them and take them to the great outdoors. What will you use your self storage unit for this summer? And what will you be taking out and enjoying in this nice weather? Let me know on Twitter at @JennyStorage. https://professional-organizer.com/WordPress/wp-content/uploads/2016/07/logo.png 0 0 Ellen https://professional-organizer.com/WordPress/wp-content/uploads/2016/07/logo.png Ellen2014-05-22 06:00:142015-06-25 19:43:03Summer storage tips: What goes in and what comes out? We love photos! We have them on our smart phones, cameras, online and in print. It can be overwhelming after birthday party or family event to gather them together. Our photos are our way of capturing the magic of the moment. Organizing photos means you will truly enjoy them. Allow time once a month or just after a family event to work with your photos. We jump back into life and don’t get the opportunity to reflect and enjoy our photos. It helps to set a time to work with these. Start with a plan. How will you group your photos? With paper photos, we group chronologically, by events like holidays, birthdays or trips, or by family member. Keep in mind your family will be growing, like adding grandkids and partners. Write out your plan and then create folders online to capture the photos as you consolidate them. Begin consolidating. Get all your digital photos together in one place. For me that’s on my computer. I email them to myself from my smart phone, download from Facebook, and move them from my camera. 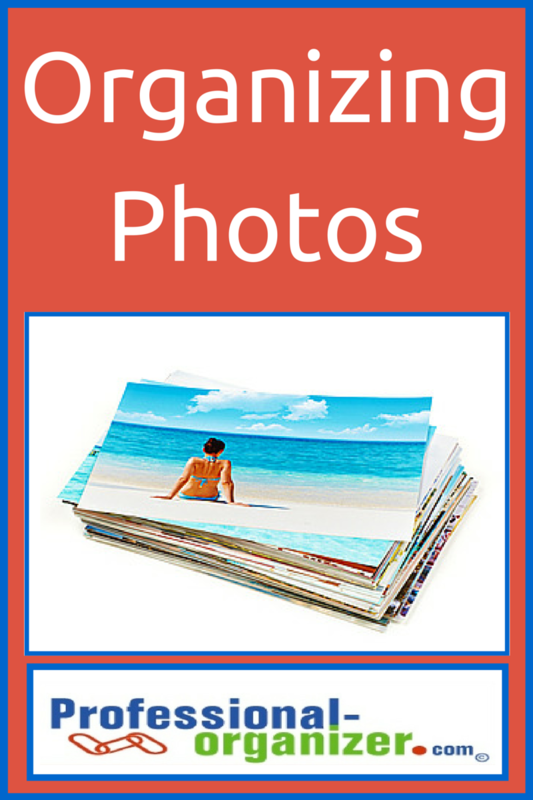 Keeping all your photos in one place makes it easy to know what you have. Always backup your photos. There are lots of ways to do this. I use Carbonite to back up all the time. But I have high recommendations for Picasa, Dropbox, Smugmug and Shutterfly. Each allows a certain amount of space with additional space for a fee. Taking the next step is the fun part. Decide what photos you want to print, create a digital photo album, or create a gift. I keep framed pictures of grand kids throughout my home. I know the frame sizes so each season I print out an updated photo. If you are just starting a photo grouping in a hallway or on a desk top, choose the frames first, then purchase the pictures. My daughter in law does a birthday book for each child. The book consists of 5- 8 printed pictures from each birthday, placed in sequence in a photo album. The kids love looking through these each year. Other options include digital scrapbooks from Shutterfly and even Walgreens.com. For Mother’s Day, Father’s Day or birthdays, gifts like mouse pad, calendar or mug are wonderful ways to share photos. Remember to give yourself plenty of time to choose the photos you want to share. Have ideas on digital photos? I’d love to learn more! 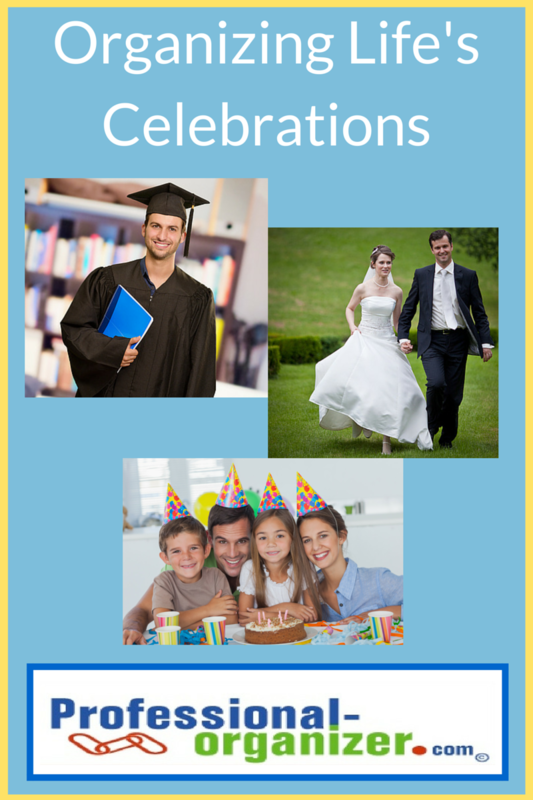 May is the month of celebrations, including graduations from kindergarten to college and beyond, weddings, and baby showers. Your family may be preparing for a family reunion celebration. Celebrations are the way we come together as a family, support each other and recognize achievement. Often we have different responsibilities to help organize the celebration. We can all have a different role in organizing life’s celebrations. Set a date early and send out a notice by email to those included. There are fabulous online resources such as paperless post and evite to include everyone. Make a list of tasks for celebration, including budget, location, food, decorations, take-aways and invitations. Check out 3 resources for each idea, makes notes in Evernote or a notebook, and make a decision so you are ready to go. Invite others in your family to be a part of the preparations. Share the responsibility and share the fun. Check in with them on their part through email, phone or text to be sure things are going smoothly. Remember to keep it simple sweetie! The bigger the plans, the bigger the stress and the bigger the budget. Simple plans create memorable occasions. Check the date and block out the time as soon as the invitation arrives. RSVP as soon as possible. In our days RSVPs are rare so help the host with this small step. Make travel plans and arrange accommodations if needed. Ask the host how you can help. You can tie ribbons, put up decorations or even bring coffee! Ask about whether and what gift is appropriate. Often a small token or lovely card is what is most important. Our family has been blessed to celebrate with nieces, nephews and other family over the past several years. Our family has attended our kids weddings at a distance. It is truly a blessing to gather and celebrate. With a plan everything comes together! What ways has your family celebrated together? What will you be celebrating this summer? Don’t miss a minute of organizing! Join my newsletter! Come back next week when I share ideas on organizing your family photos after your celebration! Mother’s Day is next weekend! It can sneak up on us with the end of the school year, summer vacation coming up and just in general. Are you ready? Here are some last minute suggestions for “all the moms” in your life. 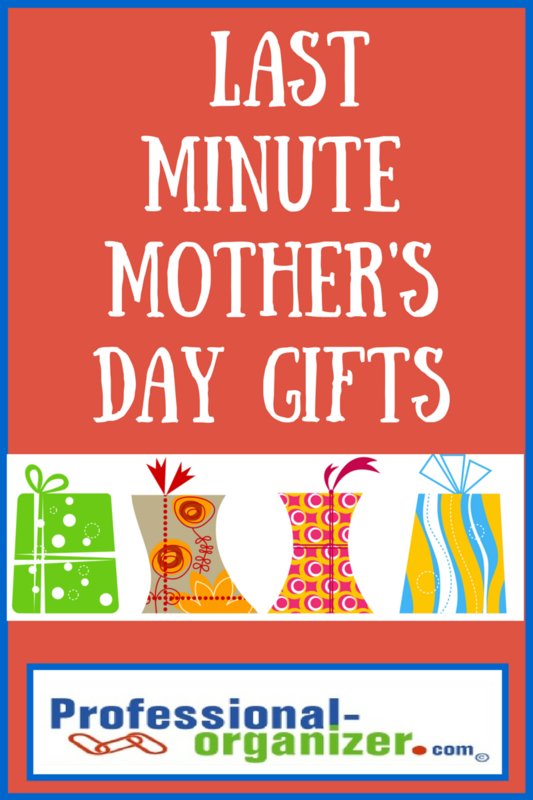 Last minute Mother’s Day gifts can be simple, thoughtful ways to tell mom, grandma, or other special moms thanks for all they have done to support you. Host a family lunch with recipes from Allrecipes.com. Have family members help with the preparation. Pick up paper goods for easy clean up. Have mom create a wish list on Amazon.com. You can select and send easily gifts. Create a Mom Mix of her favorite music and add it to her tech gadget for her. Make a donation online in honor of your mom to her favorite charity. Create a book of small gift cards for organizing or cleaning Mom’s home for her. It’s the simple gifts that are the most meaningful! Wishing all moms a special day with their families! Don’t miss a minute of organizing or productivity! Join my newsletter!